So here's this Maple Pro that I was told was a sample, or prototype when I got it. It came from the E. St. Louis area. I bought it from a guy who was liquidating his uncle's estate, and was selling this and a '54 Martin D-28. Unfortunately I couldn't get him down to reality with the Martin. He said his uncle had been a professional musician for over forty years, a very lucky man. I didn't give much credence to what the seller said (that his uncle bought it from a sales rep), but it does have some interesting features I haven't seen on other Maple Pros, and is of exceptional build quality and materials. So when I saw monty57s post, it rang a bell. BTW, welcome, monty! Thank you for sharing your guitar here. This one's a beauty to play, seems a bit heavier than usual for Electra semi-hollowbodies. 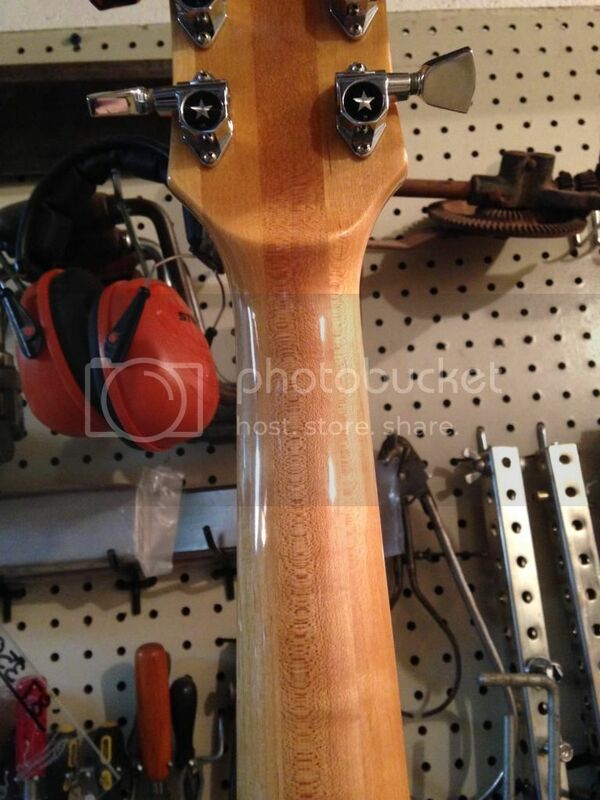 It's also the only Maple Pro that I personally have seen with this headstock, though it seems like there should be more out there. I can't recall if others I've seen had a volute, but I know the later ones didn't. Its all original with the exception of the nut... it had a cracked bone one (original) when I got it, dressing the frets, and touching up a small piece of binding that was bogeyed. There are no stickers, labels, or serial numbers. If I remember correctly it also has something different in the way of pickups and wiring, but what I can't remember right now. I really like the wood on your example. Maple Pros have always caught my eye. My fairly early elvin bishop has a volute. 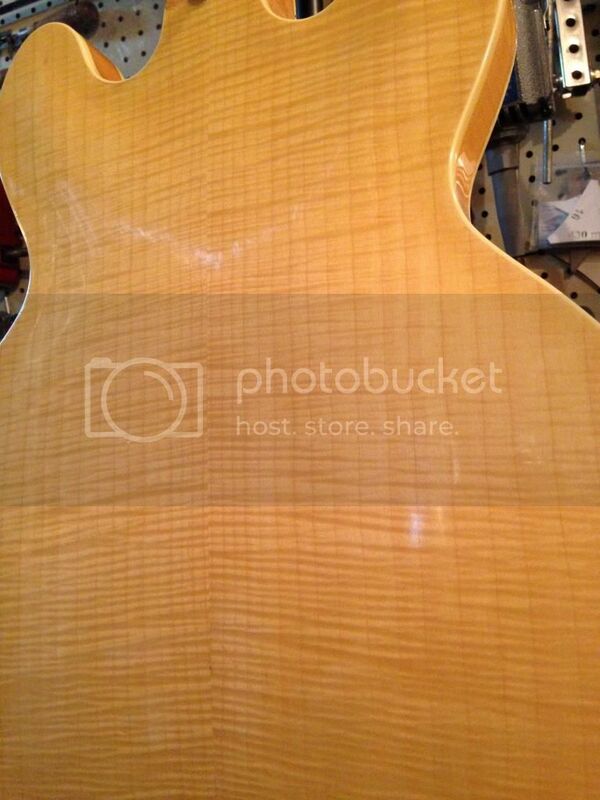 It has an early headstock, but not that gibson shape. 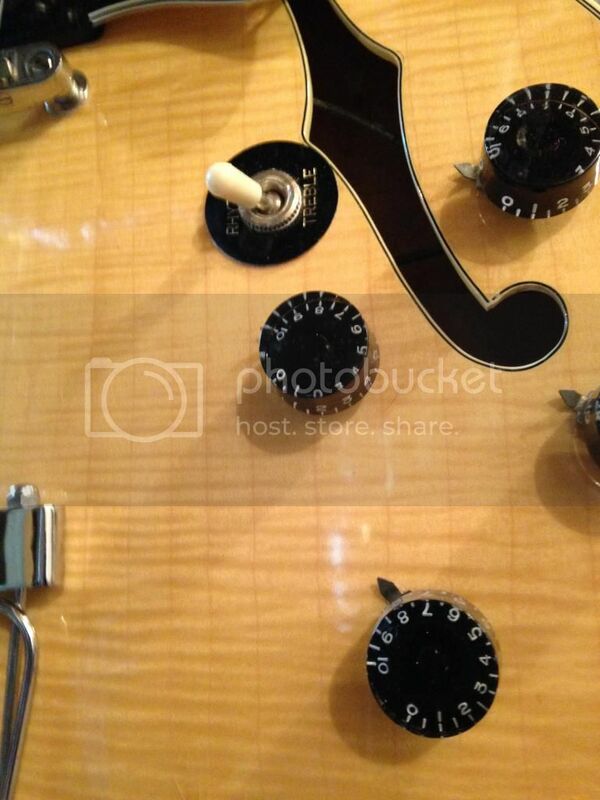 I recall only seeing those "star" tuning keys on very few ones - I have seen them before, maybe once or twice, quite rare. They are otherwise the same as an Electra key I think, they just don't have the peace sign logo on them. 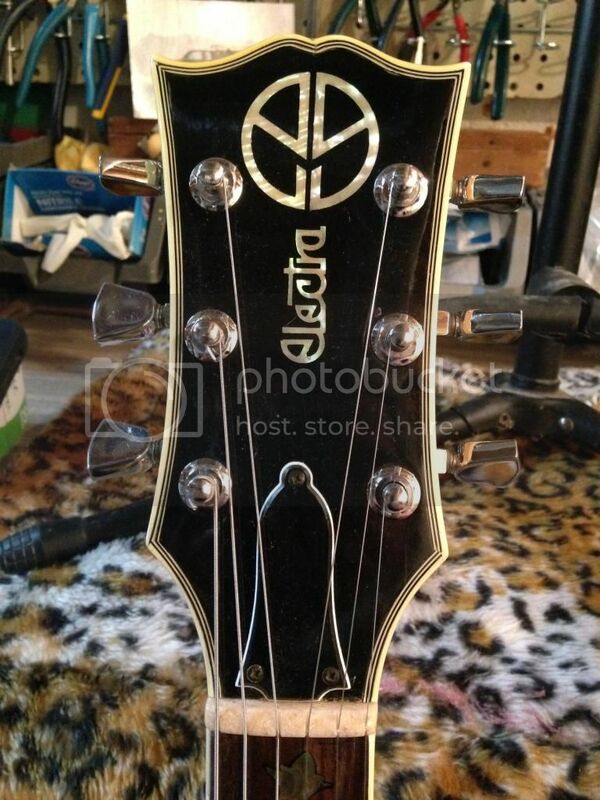 The abalone inlay on mine is just like yours I think too, with the larger size Peace sign logo, but a smaller Electra name. Mine did not have the original trapeze tailpiece on it, but mine originally had one (it has the 3 mounting holes near the strap button for it). The heel looks like yours too. Mine has a 1976 serial number. The differences appear to be mine has the small early headstock of similar size but it has a more pronounced cut out in the center (not a gibson open-book). 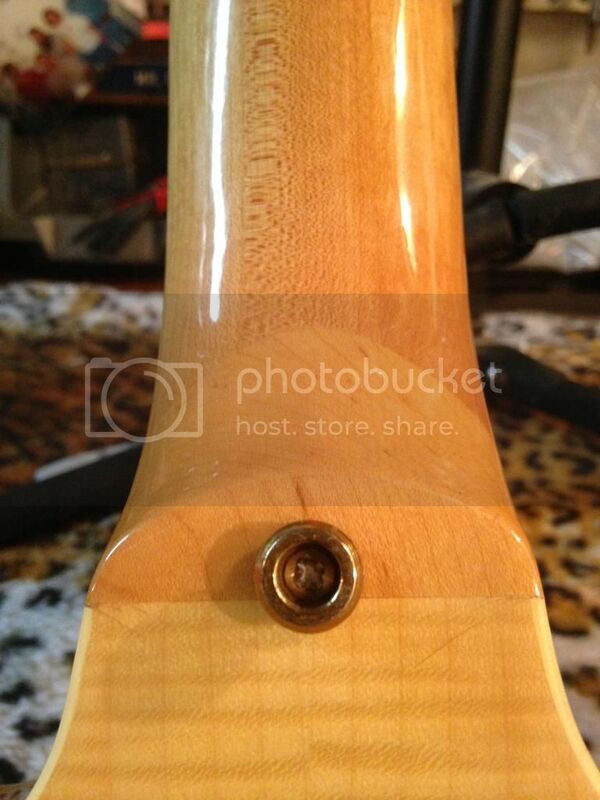 Someone had put a tailpiece on mine too (it was added afterwards). I bet we have the same manufacturer but yours is earlier if I were to guess. My f holes look smaller, but it has the multi-ply binding that is much thicker, so I could be seeing that difference. Mine has a fancier peace sign logo SLM truss rod cover). I don't know about your pickups, mine had some covered ones with it that were potted and had different cables put on it (and possibly rewound). I wound up putting sheptones in mine because it was not stock anyway and I REALLY LIKE the sheptones. Mine doesn't have nearly that nice of a top or back, and obviously is a different color. You may likely have a prototype or an earlier one than mine. Those star keys are not common. 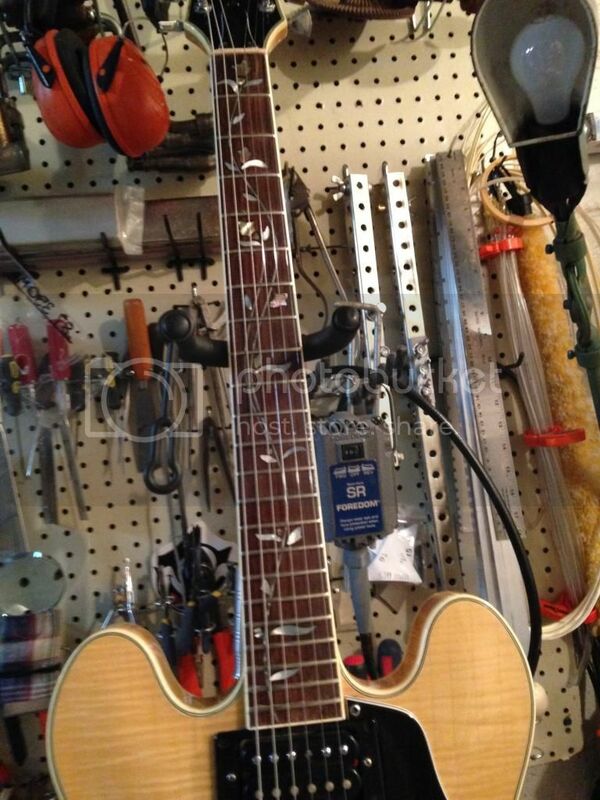 You don't have the logoed truss rod cover. 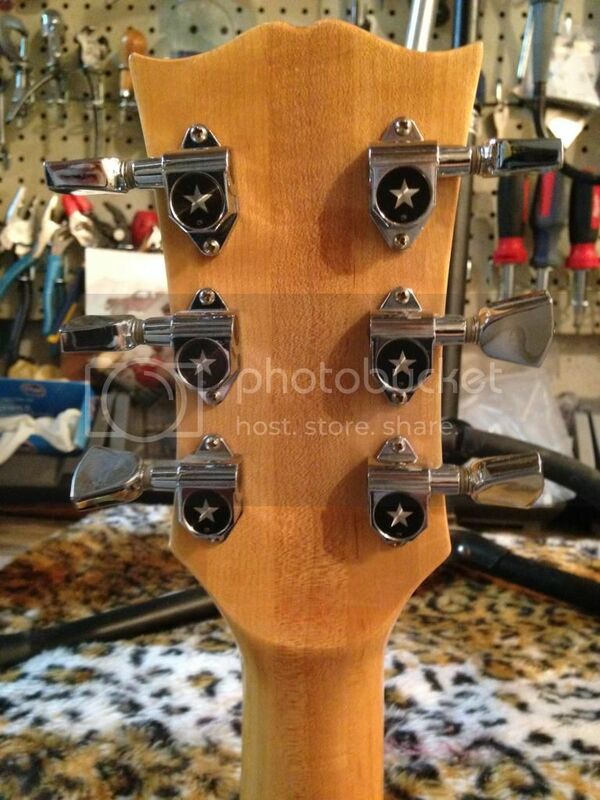 You have the Gibson shaped headstock which I don't know if I have seen on a maple pro. But so much is exactly right too so you probably do have a prototype. At least no matter what you have it sure is an awesome looker that is for sure! I wish I had my maple pro back. I don't remember who I sold it too, but my finances would not allow me to even to consider it right now. But my elvin will have to suit me for my 335 type. I just am more fond of the maple pros. They are my favorite of the 335 types. 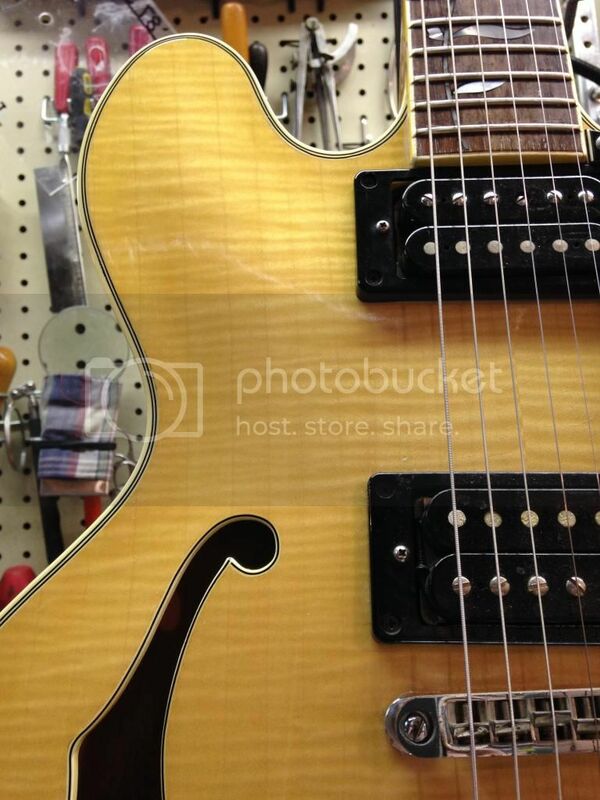 Very nice example and the headstock and tuners are very unusual on the same guitar. 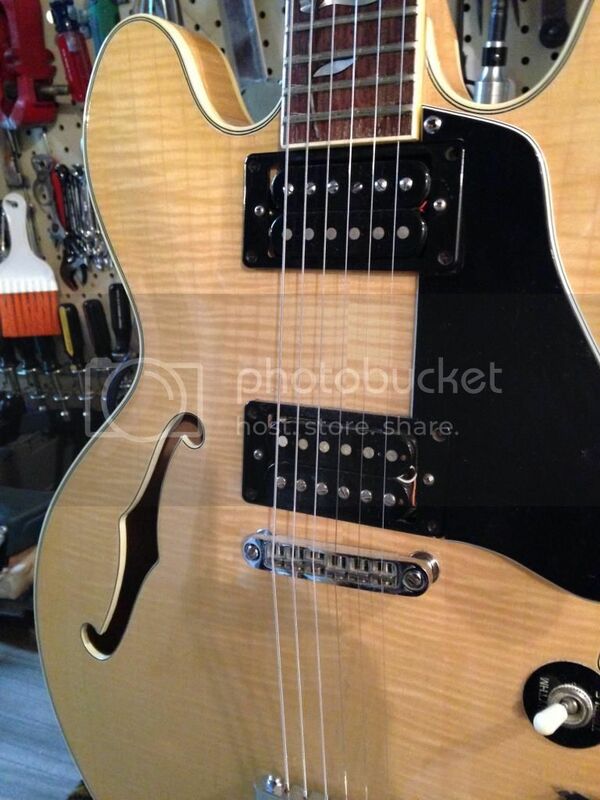 I have seen the star tuners on some of the early LP models but never on a semi hollowbody. Super nice .....Thanks for the photos. Wow! That's a beauty. I'm glad I'm over 18. I have to agree with everyone else on this one. 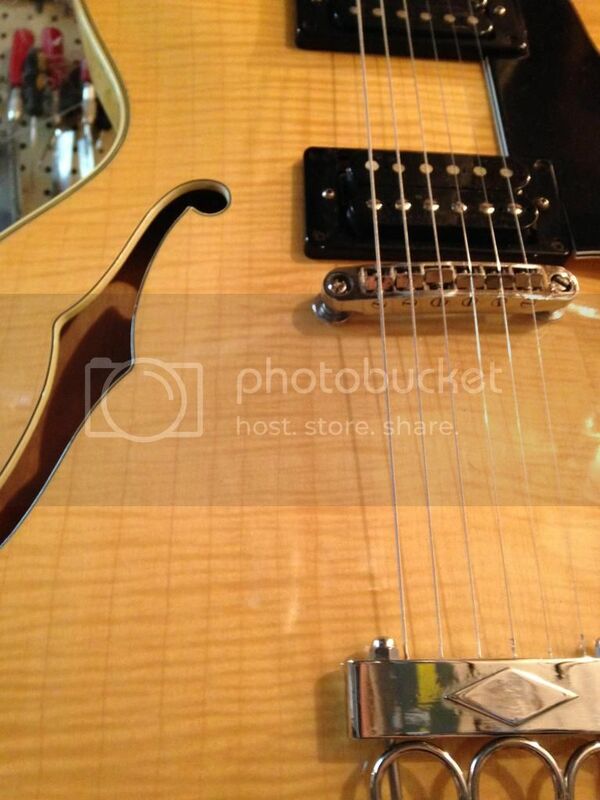 Man that is one beautiful guitar.